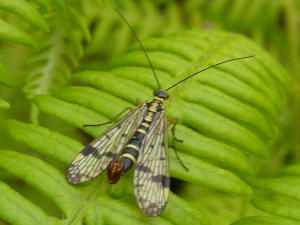 Observation - Scorpion fly (m) - Panorpa communis - UK and Ireland. Description: An insect with a beak, spotted wings and a scorpion-like tail. ID using notes from http://thetopshamnaturalist.blogspot.com/2010/05/scorpion-flies.html - thanks! An insect with a "beak", spotted wings and a scorpion-like tail. ID using notes from http://thetopshamnaturalist.blogspot.com/2010/05/scorpion-flies.html - thanks!